When it rains, or there’s a sudden snow melt (rare here in the lower mainland, but possible), it’s essential that the infrastructure in an urban or suburban area is designed so that there’s somewhere for the water to go. Otherwise, it ends up pooling in basements and around building foundations, where it can cause costly damage and lead to structural problems, mould growth, and other unpleasant conditions. 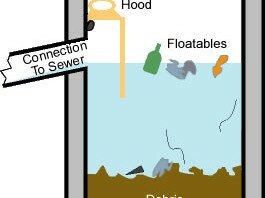 Most areas use storm drains (intakes that are connected to municipal storm sewers) and catch basins (“holding areas” for water that can fill when there’s a lot of flow, and empty slowly later) for runoff management. It’s easy to forget about storm water management systems when it’s not raining, or when they’re working properly. 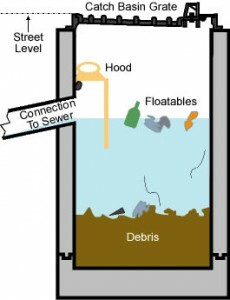 The problem is that we don’t notice that there’s a problem until it’s too late – when the water is advancing on our homes and businesses, or filling up our basements. You need to take stock of your storm water management systems when it’s not raining. Edenflo specializes in pump truck services on the lower mainland, and can help you keep your storm drains and catch basins free of debris, and your drains flowing. We operate British Columbia’s premiere pump-truck service, with high-pressure water jets to dislodge clogs and vacuum pumping to take them (and whatever else) away for environmentally responsible disposal. We even have a special “lowboy” unit that fits into lower spaces, like underground parking garages. Edenflo provides emergency response and preventive maintenance services to both residential and commercial customers. If you’ve got storm sewers or catch basins on your property call us and we’ll offer advice and service that will keep you out of trouble when the skies start falling. Have your Catch Basin cleaned and inspected annually by the experts at EdenFlo Vacuum Pump service. When you need catch basin service in Vancouver, Aldergrove, Surrey, Langley, Burnaby, New Westminster, Delta or White Rock, contact the best at EdenFlo Pump Truck Services at 604-575-1414 and schedule your annual catch-basin inspection and cleaning today. This entry was posted in Catch Basin Cleaning and tagged Aldergrove catch basin cleaning, Aldergrove catch basin inspection, bc lower mainland catch basin inspection, bc lower mainland pump truck services, Best catch basin cleaning lower mainland, best catch basin cleaning vancouver, burnaby catch basin cleaning, Burnaby catch basin inspection, Delta Catch Basin Cleaning, Delta Catch basin inspection, langley catch basin cleaning, langley catch basin inspection, Lower Mainland storm drain cleaning, New Westminster catch basin cleaning, New Westminster catch basin inspection, storm cleaning lower mainland, Storm sewer cleaning Vancouver, Surrey catch basin cleaning, Surrey Catch Basin inspection, Vancouver Catch Basin Cleaning, vancouver catch basin inspection, White Rock catch basin cleaning, White Rock Catch Basin inspection on November 26, 2018 by Edenflo. EdenFlo Best Rated for Septic Service in 2019! When You Need Vacuum Pump Service in the Lower Mainland.